At Poppy’s house we eat soup all year round, at least twice a week. But there are days, like today, where the temperature won’t move up to freezing and will end in single digits. This type of weather doesn’t just suggest a hot hearty soup, it demands it! 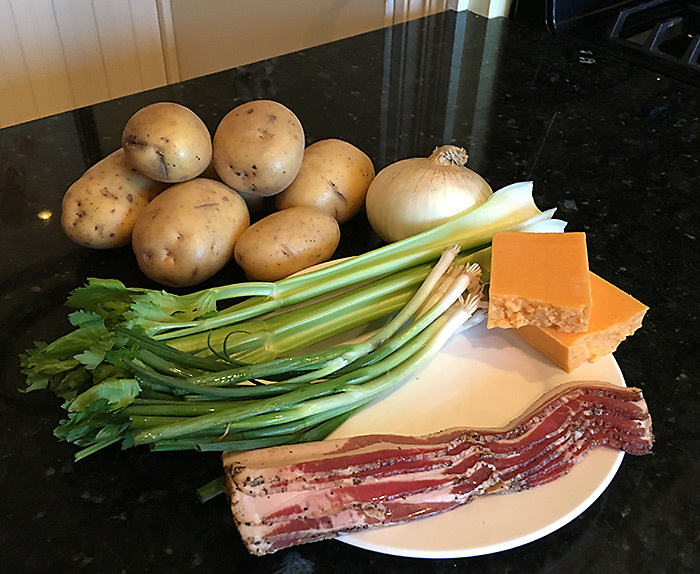 This is Poppy’s version of “Baked Potato Soup.” No, you don’t have to bake the potatoes. This soup just contains all the good stuff you might use to top a baked potato (minus the sour cream and butter). It’s easy, but does take a little time. Turn on some good music, pour yourself a glass of wine and lets get cooking. I start by cooking the bacon. My preferred method is baking it in the oven, on a cookie sheet lined with foil. 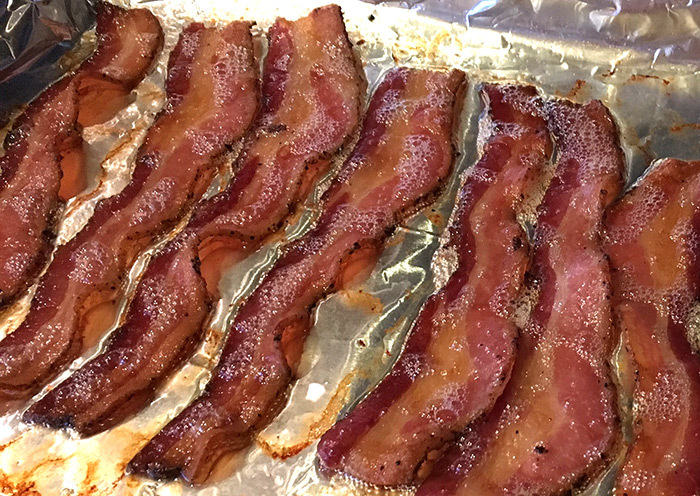 This makes the clean up incredibly easy and yields evenly cooked bacon. I set my convection oven at 350°, cook for 10 minutes, then flip and cook for another 5-6 minutes. Remove the bacon, sandwich it between several paper towels to soak up any excess grease then set aside. While the bacon is cooking, peel and dice 6-7 Yukon Gold potatoes or the equivalent. Toss the taters into the chicken broth and start them cooking. Dice the celery and onion and sauté in a mix of EVOO and butter, about two tablespoons apiece. Cook the onion celery mixture until the onions are translucent. Add the onion-celery mix to the potatoes and cook until the potatoes are tender. I like my potato soup a little creamy and a little chunky. Tonight I used an immersion blender until I got that right balance (you can add the cream before or after blending). Once you have achieved the right balance between creamy and chunky add 3-4 slices of crumbled bacon, reserving some for topping. Same with the grated sharp cheddar. Add 5-6 ozs. of sharp cheddar, reserving some for topping. Toss in 3-4 dashes of hot sauce (trust Poppy, this will not burn your mouth, it just ups the flavor). Add at least a teaspoon of coarse black pepper (I add more). 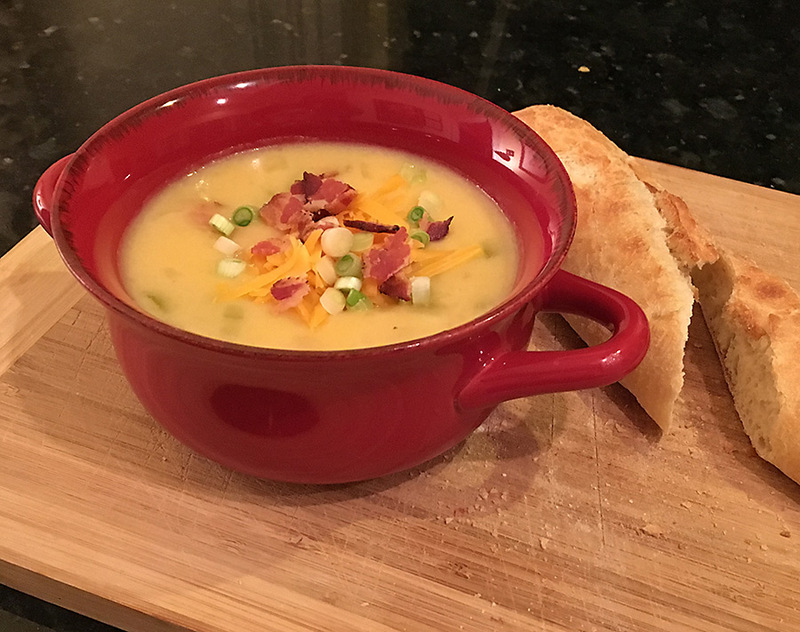 Simmer for a few minutes to let all the ingredients and flavors become acquainted with each other, fill your soup bowls then top with a hefty pinch of crumbled bacon, grated cheddar and green onions … ahhh, heaven! Most of you know our family lives in Ferguson, Missouri … yes, that Ferguson, but that’s not the point of this little missive. But now that I’ve got your attention, can I just say, believe very little of what you see or read in the media. I’ve never been in a community where there were more warm and welcoming people of all colors, but that’s a blog for another day. We have lived in two different houses during our 30 year stay in Ferguson. Both were built in 1890, both required a lot of rehab. 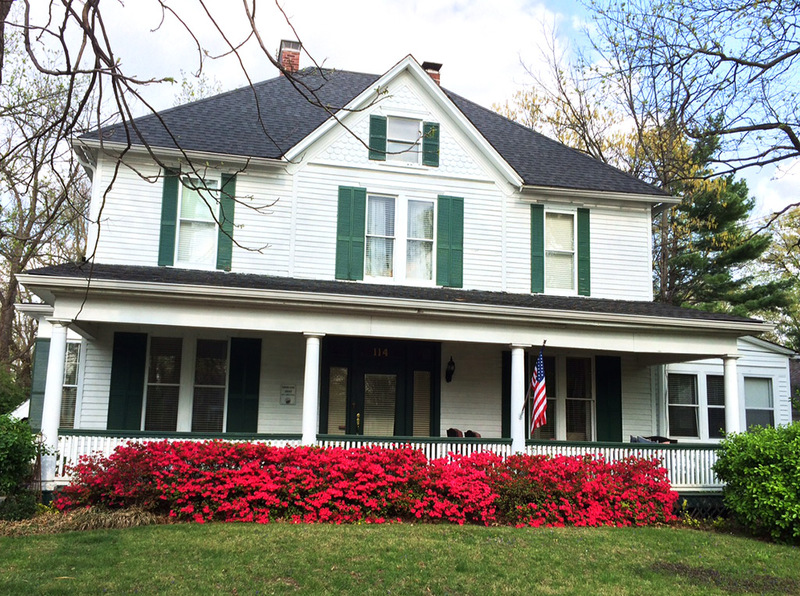 Our first house was a charming two story with three bedrooms, a huge dining room and kitchen. Architecturally it was somewhere between Victorian and Foursquare. We scraped, painted, refinished and along the way built a swing set and pergola. We also planted a perennial garden and a selection of antique roses. The house had one full bath. By that time there were three women in the family (my wife and two young daughters), plus dad. Did I mention it had just one full bathroom? During my stint on the Ferguson Landmarks Commission one of the houses we recognised as a “Century Home” was a five bedroom house with two full and two half-baths. It was owned by an elderly widow who lived alone. She was a delightful character who had been active in the St. Louis art scene and had once dated Grant Wood, the painter of “American Gothic.” She did not care much for his painting style or apparently himself, because she went on to marry a building contractor. This probably explains why the house was structurally sound, although it was in severe need of updating. This house eventually became our 2nd 1890’s home. Almost everybody says they love old houses, but they love them from a distance. Old houses are wonderful. Old houses are horrible. I feel about old houses the same way I hope Susan feels about me, hopelessly flawed but with enough character to keep you interested. During those renovation stages it was not unusual for me to come home, eat, then work late into the night on some project. I had a lot more energy back then, and Mr. Gore had not yet invented the internet so there were fewer things to distract me. No matter the project, the noisy parts …the hammering, the sawing, the pounding had to end at our girl’s bedtime. I can scrape, sand, pry up multiple layers of old linoleum that have been glued on top of hardwood floors, but I can’t prepare two young girls for bed and the next day of school. This was a logical time for me to take a break. This was a time I could sit back and relax. It was a time to quiet myself, a time before smart phones when you weren’t tempted every few minutes to check the news and the latest Facebook posts. But most of all, it was a time to listen. And this is what I heard. I heard the sound of my family drifting from the upstairs bedrooms, down the staircase and flowing into the room where I sat. I heard the sounds of bath water being drawn, the faint clink of the ironing board as tomorrow’s outfits were pressed and the creak of 100 year-old wood floors. But it was the melody of voices from the people I loved more than life itself, that brought me pure joy. The tapestry of sounds made up of fussing, giggling, complaining and laughter. The banter, the questions, the conversations. I may not have smelled the best at that point, I was probably covered in a thin layer of grime and sawdust, but I was content. This was my family, I was the dad, the father and now the grandfather. To this day, I cherish the role of protector and provider. Was this how God felt? Do the distant voices of his children make him smile? When I first heard the concept that as parents we will love our children more than they will ever love us, I was a little taken aback. I certainly loved my parents and surely my children loved me. But the more I thought about it, I believe it to be true. I also believe that it is not a bad thing. At a certain point I needed to establish my independence. The natural order of life lays down a pattern where the child leaves the parent and established their own life, their own family, their own children. Did I care about my parents? Of course, but I didn’t lose sleep worrying that they were going to make a bad decision or run off and join the merchant marine. I’m a bit of a slow learner, but I finally figured out that once you are a parent, you’re a parent for the rest of your life. This was not in the manual. Being a parent doesn’t end when your child reaches a certain age. They get their driver’s license, you’re still a parent (In spades). They can vote, they reach 21, they get engaged, they get married, they stay single, they get divorced … you’re still a parent, and you still worry. It never ends. If I, as an imperfect parent continually stays worried about the well-being of my children, how much more does our heavenly Father care about us? My mother is now 100. 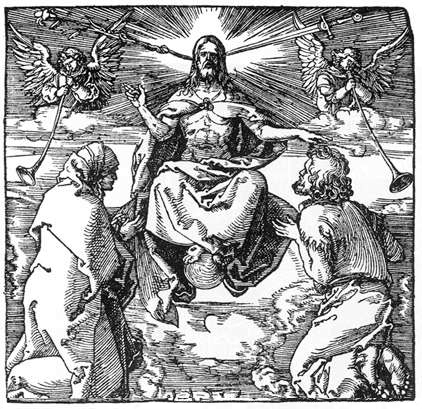 From what I understand, God is considerably older. I am a child of both, they love me more than I love them, and they are constantly worried that I will turn out okay. In my teens, I was invincible. During my 20’s, I was smarter than anyone. In my 30’s, I was incredibly clever and my 40’s brought a level of sophistication that had never been seen before. The common thread running through those decades was a degree of self-absorption that now makes me blush. There are not many advantages to getting older but there are a few. I know just enough now to know how much I don’t know. I doubt that I will ever lay claim wisdom (I’m too smart for that), but I will acknowledge at least a certain degree of perspective. Viewing the panorama of past decades allows one to better rank current events and situations with those that have been previously experienced. Events are now filtered through a sieve that allows all the small stuff to fall through. As the years go by you start to understand what seemed like a big deal in your early years was truly fluff. You also start to understand some of those things that were neglected in your early years truly were important. You eventually learn that the universe does not revolve around you. You grasp that time spent listening is much more important than time spent talking. If you are lucky, the years will allow you the luxury of being comfortable in your own skin. You can learn to appreciate your strengths and not be devastated by your weaknesses. I am okay with never having ripped abs, understanding particle string theory or much closer to home, being organized and not leaving piles of mail on the nightstand. Though Susan is still holding out hope for the later. Hopefully you learn not to dig up the corpses of past mistakes. Don’t stare in the lifeless eyes of the “should’ve, could’ve, would’ve.” Let those mistakes stay buried, allow them to decompose and enrich the soil of future growth. I’m slowly learning that it doesn’t matter what make of car you park in the grocery store parking lot. But it does matter how you treat everyone you come in contact with in the produce aisle. Every person you come across is a child of God. They may be saints; they will be sinners. They may leave piles of mail stacked up on their nightstand, but they will all have a story to tell. Our lives are a tapestry of events and relationships. Don’t limit your tapestry to 3 or 4 threads. Talk to people who are violently different from you. Listen to their stories, it will not diminish you. Acknowledge that you don’t have all the answers (except to your grandchildren, keep them fooled as long as possible). Life rolls out ahead of you, it’s a two-lane twisty affair with potholes and unexpected turns. You make mistakes, you make adjustments, you turn the high-beams on, you check the rear view mirror … you keep driving!